Woot Woot.. Macgyver is now back on TV2 but showing very late at night. Just finish watching it on the tube at this moment of writing. He always look so cool and relax while trying to device a way to defeat/escape from his enemies. Now, as an adult, I do have some doubts whether some of his electrical tinkering will actually work in real life though. I don't want to throw away my childhood fascination/admiration on his genius though..so deep in my childish heart, I will always believe that the stuff shown on the show really can work in real life!! 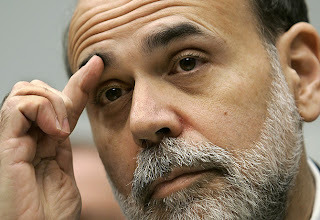 One of the most influential person in the US market will certainly be the Federal Reserve Chairman Ben Bernanke. The Fed chief issued a sobering but not entirely unexpected prediction that economic growth in much of 2008 is likely to be "sluggish" before gathering strength later in the year. He told the Senate Banking Committee during Valentine Day that further losses were likely at banks from soured mortgages. 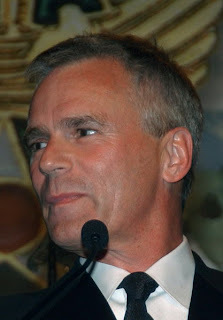 What he said and do as a Fed head honcho can easily move the US markets in either directions. Looks like his comment on Valentine Day, it not that ROSY for the investors as the Dow Jones is down again today intraday. I don't think the FED will cut rates so soon again even though the US is slowly heading towards a recession. The only thing we don't know is how hard the recession will hit for the Americans. The recession fear is growing in intensity evidently as the Dow Jones is not so unresponsive anymore to magic bullets like interest rate cuts, strong company earnings & positive economic reports. The previous cuts brought quite a extensive short term rally before the stock market required another higher dosage of interest rate cuts. It is like a drug addiction with the withdrawal syndrome deepening with each passing day. The big question is when is the US going to REHAB? After the 2008 Olympics as most Malaysian punters believe? Nobody knows for now. Can Ben be the "Macgyver" to save Wall Street from recession? Only time will tell.